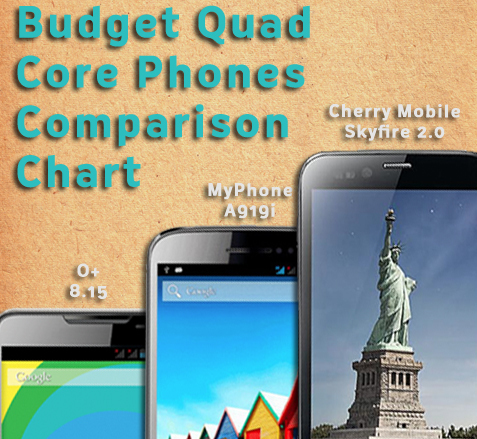 2 local mobile phone giants, O+ and Cherry Mobile are launching 2 new quad core phones this weekend – the 8.15 and Skyfire 2.0. While MyPhone fans are busy tinkering the A919i’s, we thought of developing a chart to guide those who have not yet decided what smartphone to buy. Man, you guys must have already received your midyear bonuses! So, what do you think, guys? What are you getting this weekend? As for me, I’d go for O+ USA 8.15, and I’d get it on Saturday at SM North Edsa para may 3k na discount.